Gertie went to the Rainbow Bridge on August 3, 2005. 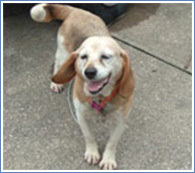 BREW Midwest's senior beagle Gertrude (Gertie) went in for emergency surgery on 8-2-05 and passed away quietly during the night. Gertie was with her foster family for exactly one year and she was loved very much. She will be missed by us all.